The Ride to the Beach is part of our workout series. The tour starts about two blocks north of Union Station in Downtown Los Angeles. 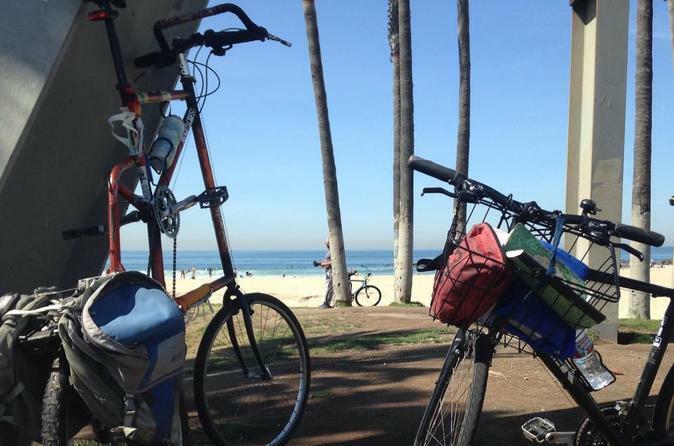 This could be a 40 to 57 mile bike adventure that will show you the real side of Los Angeles. You will get to see and learn about most of the Los Angeles area and the beach communities. During this tour you will see places like: The Arts District in Downtown, Skid Row, South Park, USC campus, Expoxition Park, Memorial Coliseum, South Central LA, Culver City, Marina Del Rey, Venice Canals, Venice Beach, Santa Monica, Century City, Brentwood, west Hollywood, Hollywood, Little Armenia, Thai Town, Silverlake, Echo Park, Angelino Heights and Chinatown. We will provide you with a 24 speed Hybrid Bicycle, water and a very knowledgeable guide. This tour can easily be called the Historic Downtown Tour. During this tour we will talk about early Los Angeles and all of it's history until present time today. We will talk about historic structures, architecture and Art. We will make stops at Historic places and visit a few buildings with beautiful architecture like: Art Deco, Spanish Revival etc. We will also talk about Downtown's current building boom and it's revitalization. We will ride through downtown's many colorful districts and crane filled South Park area. This is a slow paced bike ride filled with stories about old downtown and an in depth look at the real side of the city. We will ride past and talk about sites like; the Staples Center, LA live, Disney Concert Hall, The Broad, Angeles Flight, Historic Theater District, The Convention Center, South Park, Little Tokyo, Civic Center, Union Station, Skid Row, Flower District, Fashion District and all of the surrounding areas ending in historic Olvera St. This is the perfect way to ride, learn and explore the Downtown Los Angeles area. Our knowledgeable tour guide who was raised here in LA, will make sure to give you the best experience of Los Angeles on a bike. See you on the road!